Again i find my self sitting at home trying to come to grips with 'the normal' life again. What is normal? Having showers everyday, going to work.... That just sounds boring. This time after spending three months living in a tent and only having the odd shower, i decided that i am not 'normal'. I like going weeks without showering, living in the dirt, eating pasta and rice every night. At least i get to travel the world doing what i love, climbing in the most amazing areas in the world. I mean check this place out! The Buttermilks main area, Bishop. After a weekend out climbing and talking to some people, after a spur of the moment decision i found myself booking my flights to the US. I was off on a bouldering trip. 3 months in the States with Isaac Buckley, Chase Gatland and later Elena! We were heading to one of Americas and the worlds best bouldering spots, Hueco Tanks.This was going to be only my second bouldering trip in the past few years so i was super excited to see how it went. Driving from El Paso out in to the desert to Hueco, i felt like we were driving in to the middle of nowhere. Endless flat deserted land with a fair bit of trash scattered around. Driving along this road you would never expect to be going climbing anywhere until you turn this one corner and a huge pile of red boulders appear on the horizon. 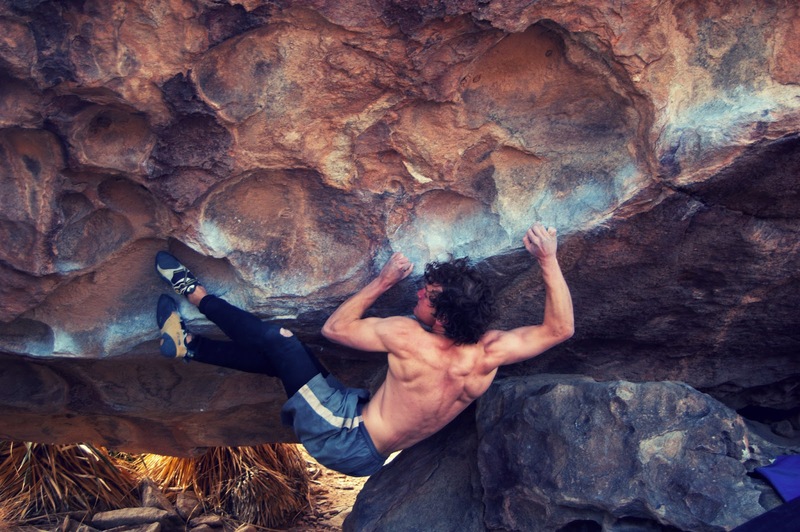 Surrounded by sandy hills with a never-ending cliff band stretching for as far as the eye can see, my finger tips began to sweat and i was ready for a hard few months of bouldering. "Hueco Tanks here we come" came rushing through my mind. The view from West Mountain looking back at North Mountain and beyond. The climbing got off to a good start, with all three of us running around ticking off many Hueco classics, topping it off with a good send of Loaded With Power V10 on my first day. This gave me good confidence as i had never really bouldered this hard before so i was very excited to see what the future could hold. Isaac strapped down tight for the long ride to El Paso's Hospital. Dont worry he was okay! After a long day-trip to the Hospital he came back to camp later that day with the diagnostis of 'Dehydration'. :) This secured a good rest day or two! Close to about two weeks in to the trip we came across an awesome cave problem with big moves between beautiful edges called Diaphanous Sea graded around V12. We all im,mediately became very excited and got to work. After about an hours work puzzling the moves together we all seemed pretty thrashed and began to pack up. Chase decided to go for one last burn and managed to crush his way to the top. Making it the first of the grade for him. Watching this got me super psyched and i had to give it one last burn. I quickly put my shoes back on and crawled to the back of the cave. Chase had just started the send train, so i had to take the opportunity to jump on it. Before long, i was at the top. I was super excited to have done the problem and also secured my spot on the 'send train'... :) This was my first V12.(?) Check out the video a good friend of ours made. For the rest of our trip in Hueco we would have many up and down spells. We would sometimes go weeks without sending any of our projects and would begin to wonder if we were getting weaker trying the same hard move over and over. When this did happen we would take a few days off 'hard projecting' and spend our days running around the mountain climbing many problems between the V5 to V8 range. These kind of days would sometimes turn out to be some of our best days climbing. We really enjoyed the feeling of climbing whatever you want and having no pressure to send it or not and because of this we felt like we climbed much better on these days. Wiz Fineron on Full Service V10, East Mountain, Hueco Tanks. Since moving camp to the Rock Ranch, when walking to the park we had been taking an awesome short cut which involved jumping a fence... But one day it became a not so awesome choice. Up until New Years Day it had worked perfectly making the every day walk to the office 30 minutes instead of an hour or more....But on New Years day there were many people lining up at the gate (we didnt think about this of course..) Me and Isaac rolled on in to the office and asked to sign in to North. But what we didnt know was that they had not started letting people in yet so the lady replied "How did you guys get in here...? there is a huge line back at the gate...? The next thing we know, the State Park Police women was on our case and told us to get in to the back of her truck. As she was driving us out of the park back to our camp we noticed a large machine gun standing proudly between the two front seats...??? My citation ticket. lucky we were from NZ. After a long wait, while the officer wrote our tickets we finally heard our consequence. The officer said that luckily for us, since we were young and from NZ she was not going to arrest us and take us to court but instead she banned us from the park for three days. Apparently they take trespassing very serious in America. I guess this was better than going to court etc but three whole days of sitting around camp in the middle of the desert and no climbing was going to turn us insane! Lucky we had the foosball table. Unfortunately three days rest turned in to 5 as the following two days after the ban was over it snowed. By this time we were fairly good at foosball. I hate to say it but the long rest was pretty damn good for us as we returned with way more psyche and feeling much stronger than before. I had been trying an awesome problem called Barefoot On Sacred Ground. An awesome arete problem topping out fairly high up the classic Sea Spot Run. I had been having trouble with the last hard move to the hueco, not being able to hold the swing so i managed to find another high sneaky heel hook locking me in making the move completely static. I fond that this was pretty damn hard to do from the bottom as i was almost completely out of power by that stage but after a good rest day i came back fresh and climbed to the top. Completing this problem felt great as it felt like my hardest yet. This was my second problem graded V12. 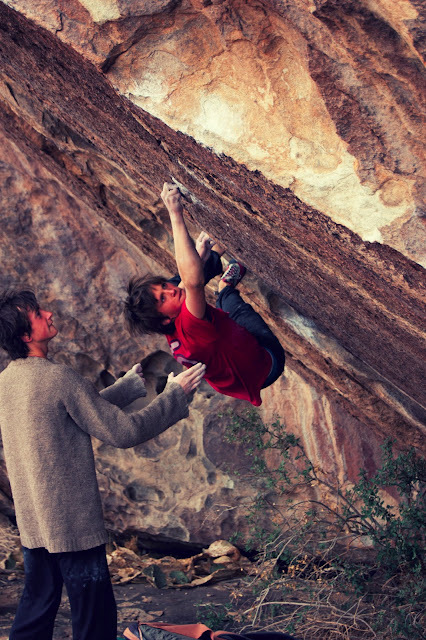 Wiz Fineron on Crimping Christ On The Cross (V10) East mountain, Hueco Tanks. Whilst staying at the rock ranch we had met many awesome people and made lots of friends and they helped us out a lot so we are hugely grateful for that. Especially our good friend Kwang. The man with the brains and also a car. He became our taxi driver and also a good climbing partner which was awesome but of course, who ever hangs out with us normally got in trouble. 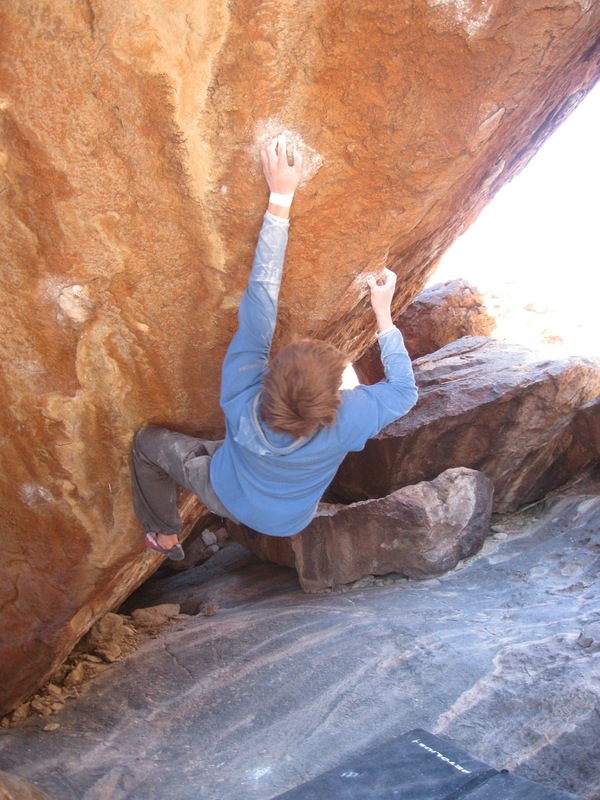 This leads us to our third and final Hueco Tanks dilemma before we decided to scarper off to Bishop. My dream problem!!! 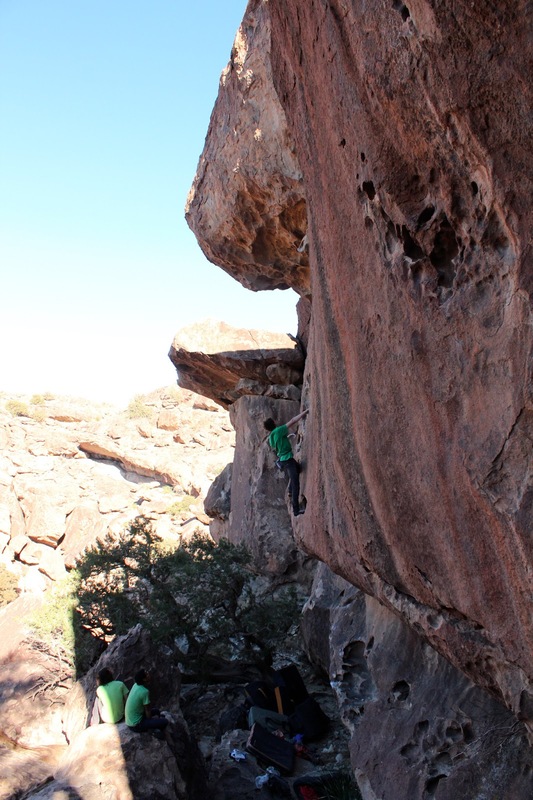 Wiz fineron working on Slashface V13 (the crux move) East Mountain, Hueco Tanks. Knowing that we were leaving soon meant that we did not have long to try and achieve our goals and for me it came down to my final three days. We had decided to splash out a bit and pay for more guided tours as we had unfinished business on the other mountains. Three days to go and three problems to do. First up was Full Service V10. It was my second day working and went fairly quickly after making some minor adjustments to my betta. Later that day i had the chance to finally have a play on my dream problem Slashface. A beautiful line through some really small crimpers following a thin horizontal crack. I had the opportunity to play on it with really nice guy called Alex Megos (He has now just done the worlds first 9a onsight...) This got me really psyched as i was trying one of the coolest looking problems in Hueco and to be climbing it with some one so strong. After about 45 minitues of work i had managed to pull all the moves and even linking a few. I was super happy and really thought that it could be possible. I had to leave it for that day as it was getting dark but was super excited to return ASAP. Chase sending Sunshine (v11) on mine and Isaacs last day in Hueco. One Day left and one to go. It was our last day and i really wanted to go back to Slashface for one more chance. Unfortunately it was not the happy ending i wanted as three days on in Hueco is not the best and i was thrashed. I still gave it a few really good goes but had to make the decision to leave it till next time. It was hard to accept that i had run out of time on it but it was good in a way as it meant that i definitely had something to look forward to when i return. (Bishop) will be up soon. Looking forward to the film. When can you come back to the US? you forgot the potatoes & may-o!!! it was aweomse meeting you guys in Hueco!! Start practicing how to type without looking at the keys! lol =] When Lee and I go on our road trip you can bum with us because we're not normal either!